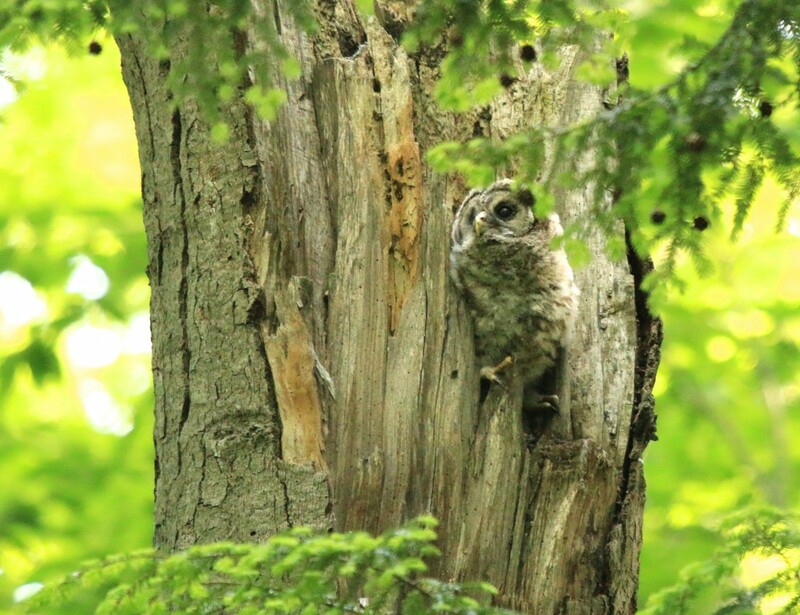 This spring I had the incredible opportunity to observe barred owl babies growing up. 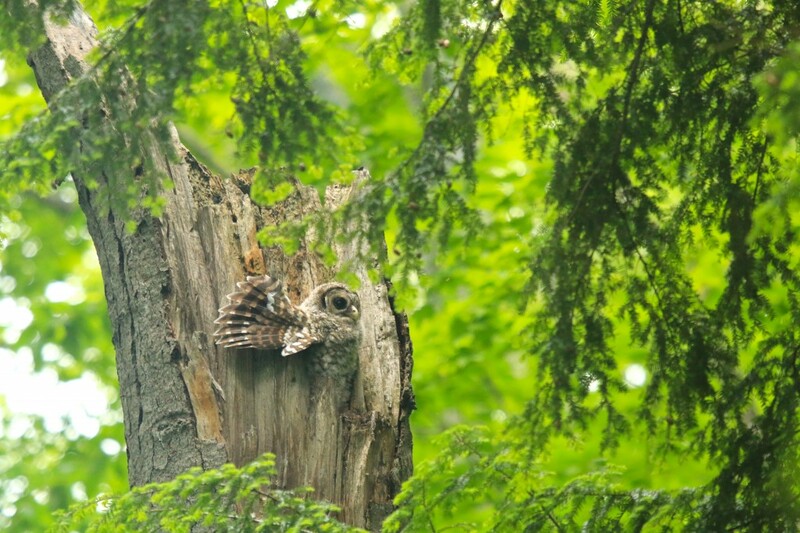 This is the first view I ever got of a barred owl baby. 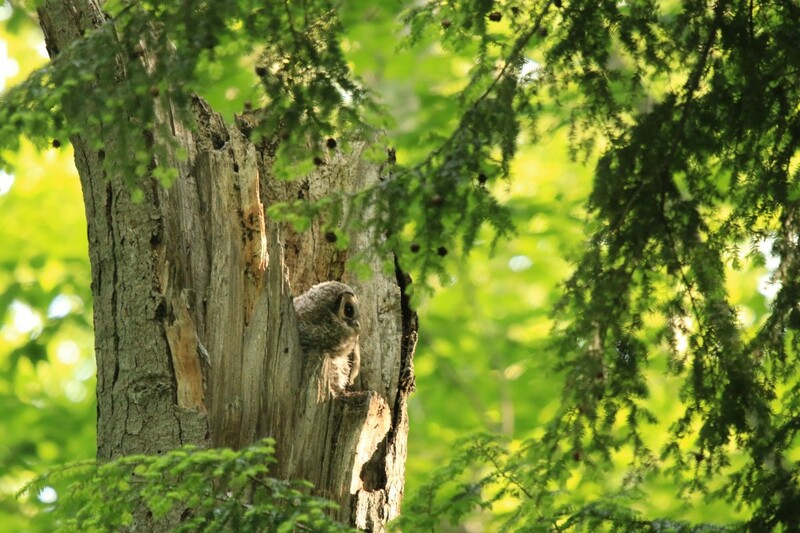 The nest was in the snag of an old beech tree. 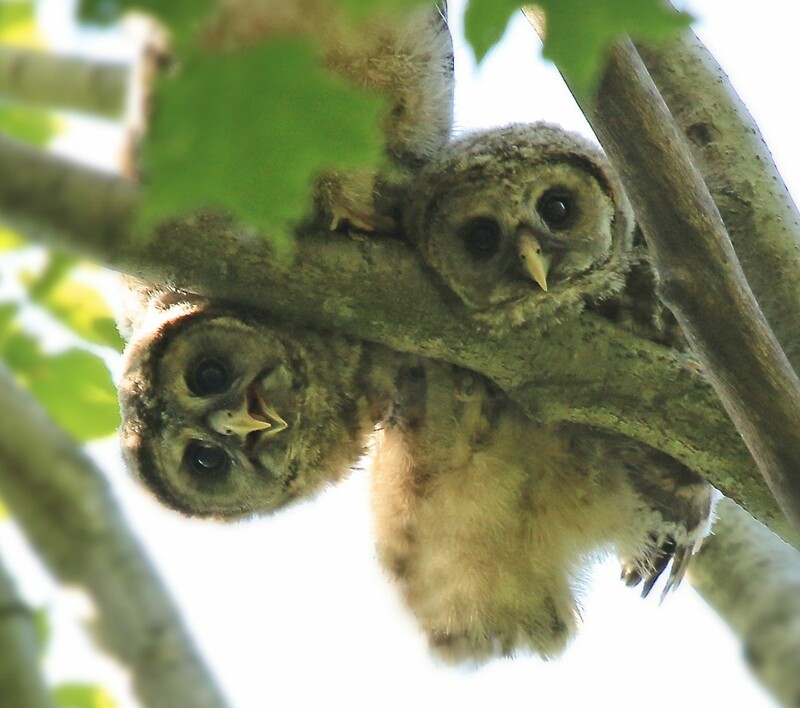 I estimate the owlets were about 3 weeks old the first time I saw them. Well, I say “them,” but I rarely saw both of them out at the same time. They spent a great deal of time looking around and waiting for the parents to come back with food. 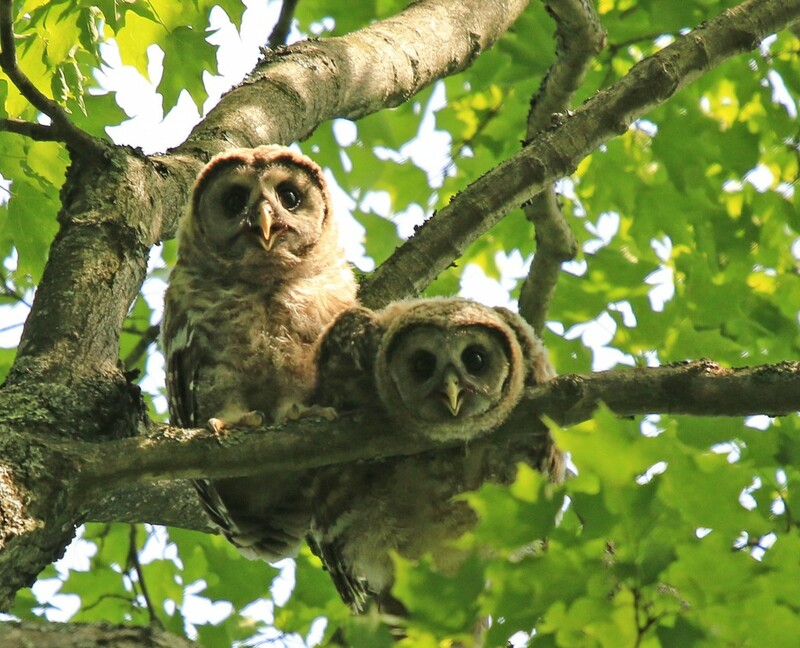 Both parents hunted for them. The nest got pretty tight. 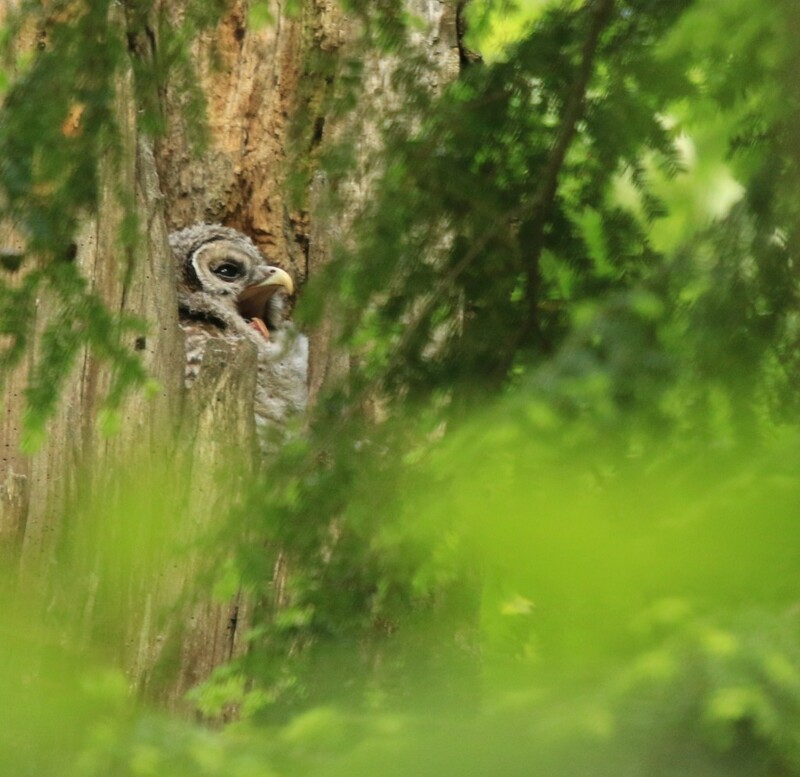 One evening one of the owlets started flapping and climbing all over the tree. 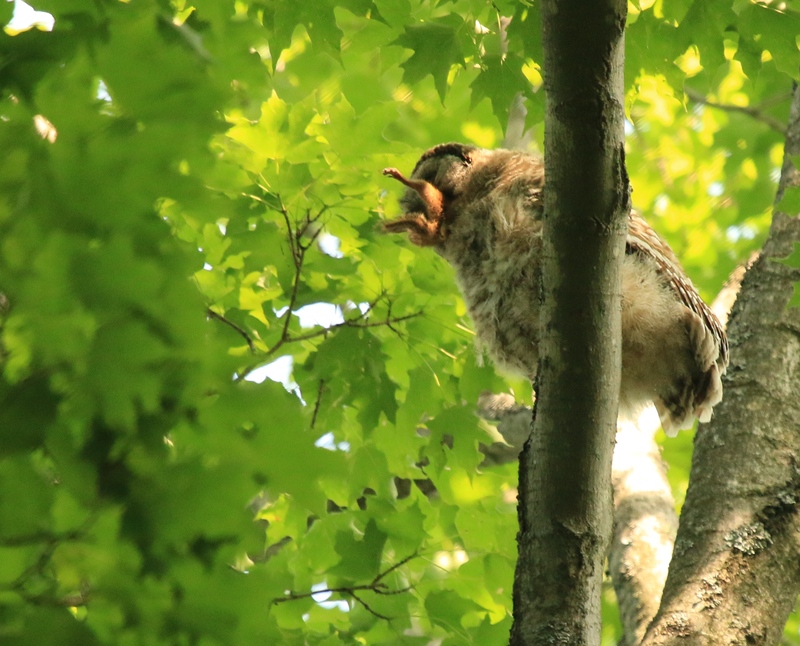 I didn’t know if it would jump right out of the nest while I was there, but as the sun went down it decided to stay home for the time being. 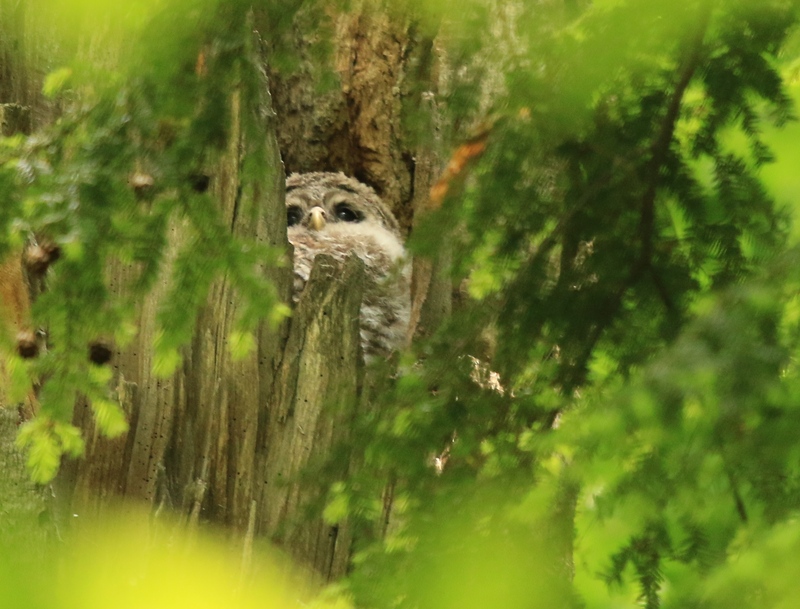 A couple of days later I went back, and expected the baby owls to have left the nest- but they were both still there- bulging out of it! 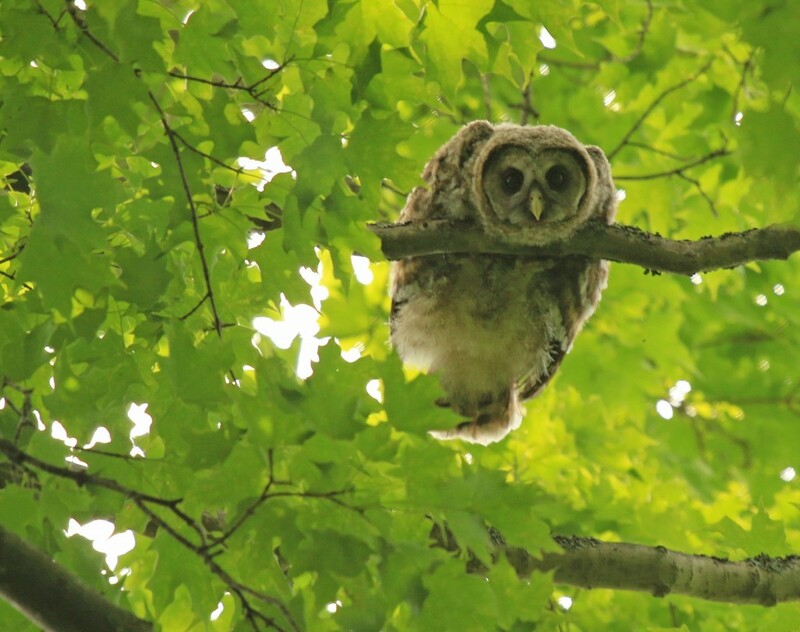 The owlet actually flapped its way up to the top of the tree snag! There it sat, looking around. It started to rain and I could hear thunder in the distance, so I headed home. 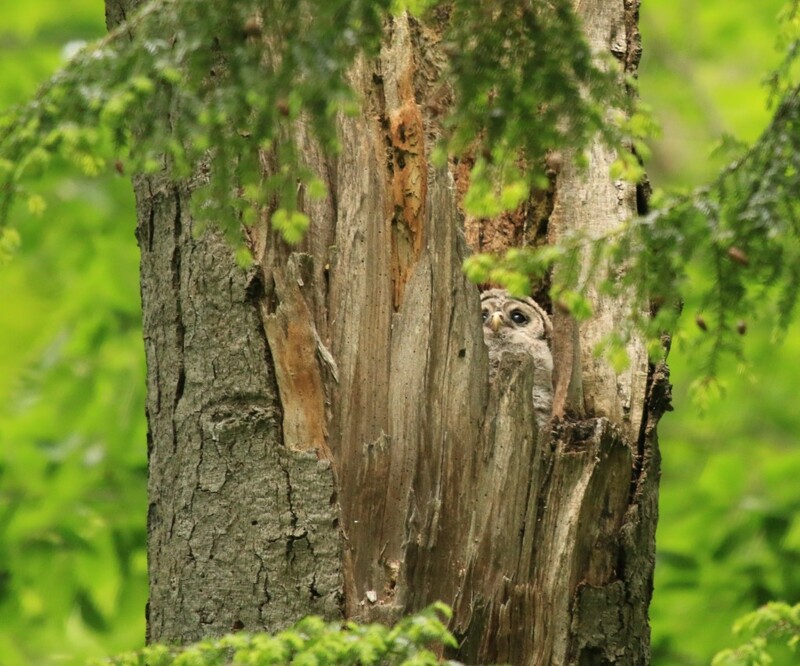 Definitely spent some time that night worrying about the little owl sitting out on the tree in the storm. 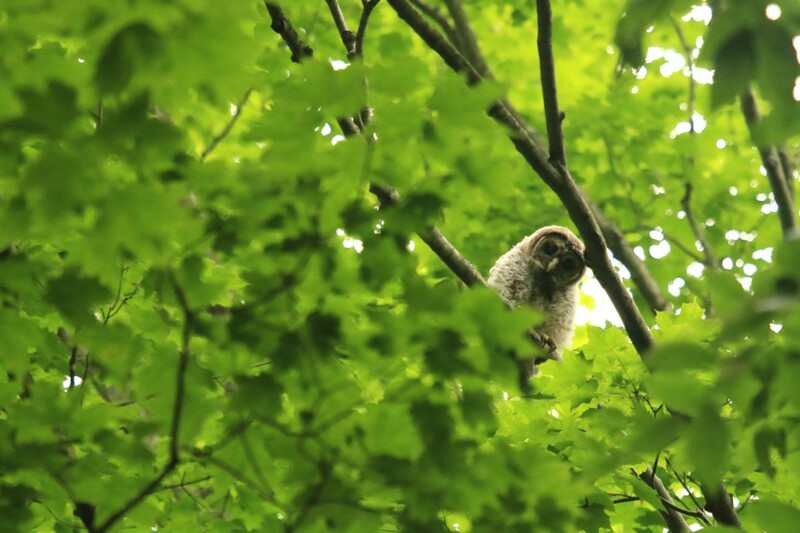 The next morning I took a walk to see if the baby owls were ok, and found they had left the nest. 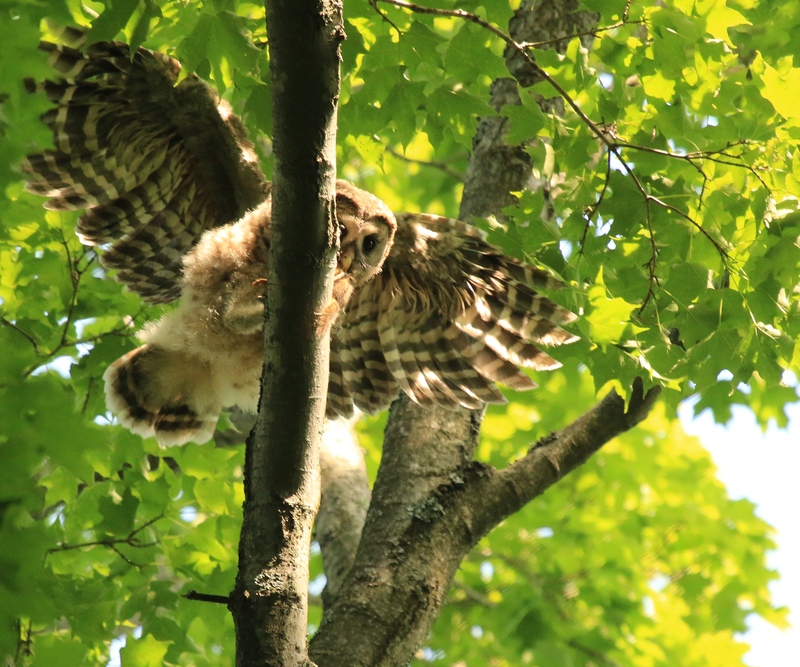 At this point they are called “branchers.” They can’t fly yet, but use their sharp beaks and talons to climb around very high up in the trees. The photo above is when I first spotted one of the owls. 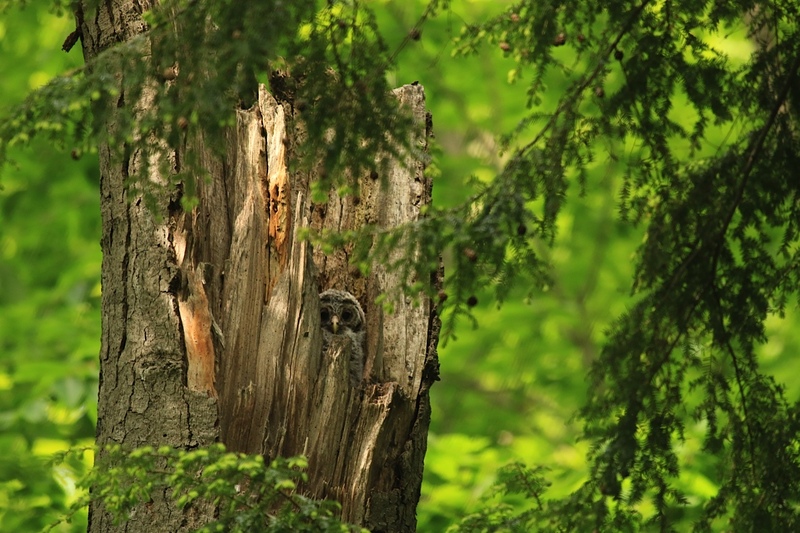 Of course, it had spotted me first, but it felt quite safe I am sure, judging by how high up it was in the tree. 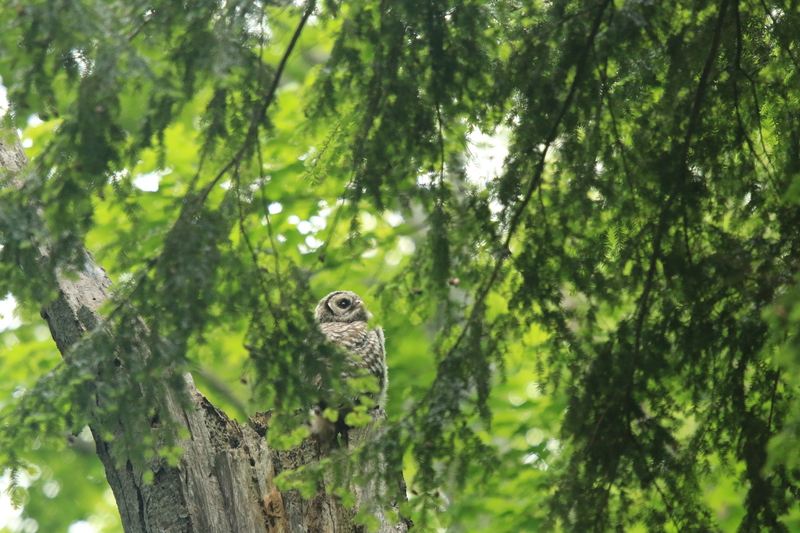 Later the other owlet came and I saw the two of them together. 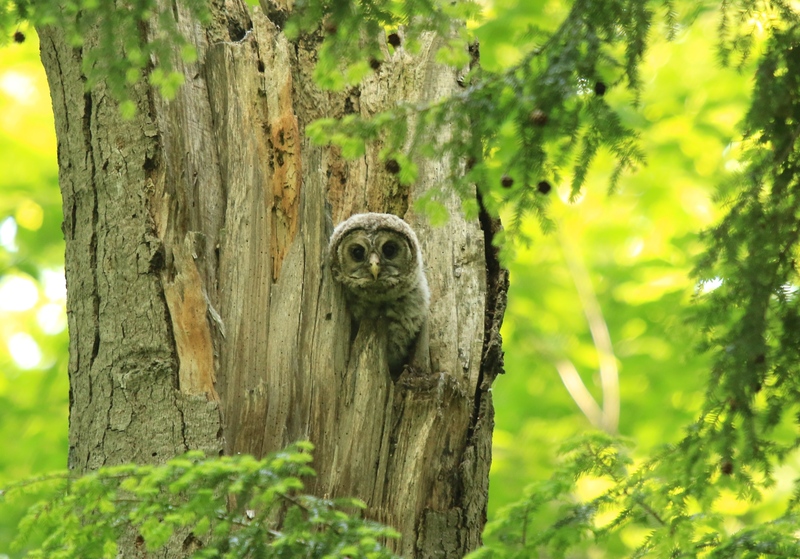 I did not go back for a few days, and when I did it was incredibly hard to find the owlets. 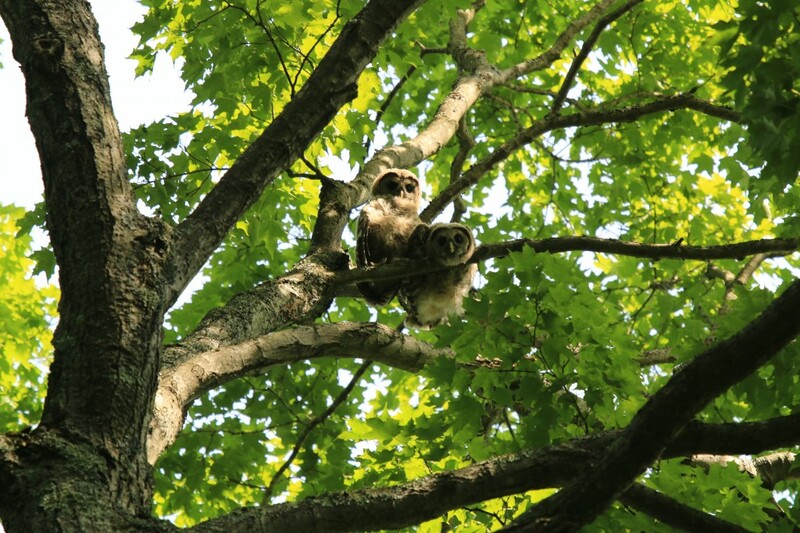 They were starting to fly short distances, and were way up a tree, hanging out together as usual. 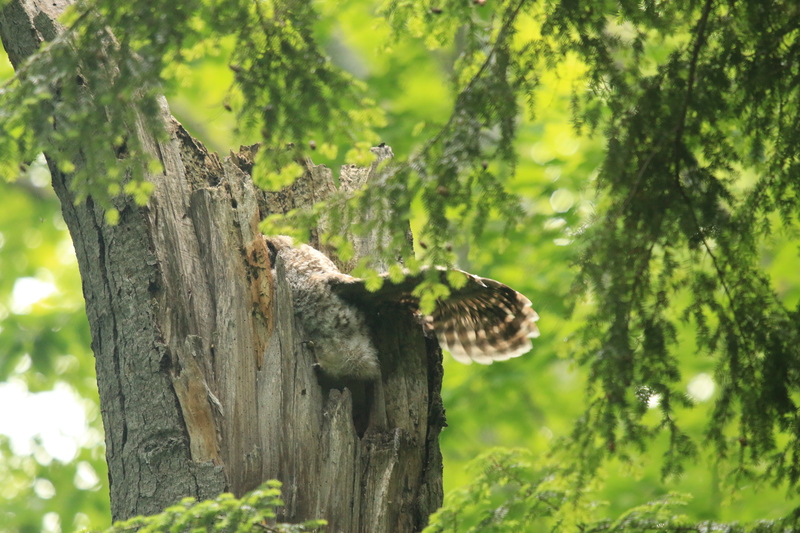 Amidst all kinds of hooting and screeching, the mother owl came with a red squirrel to feed one of the babies. Here she is trying to hand off the squirrel to the baby. It took 3 tries before the baby could handle it. 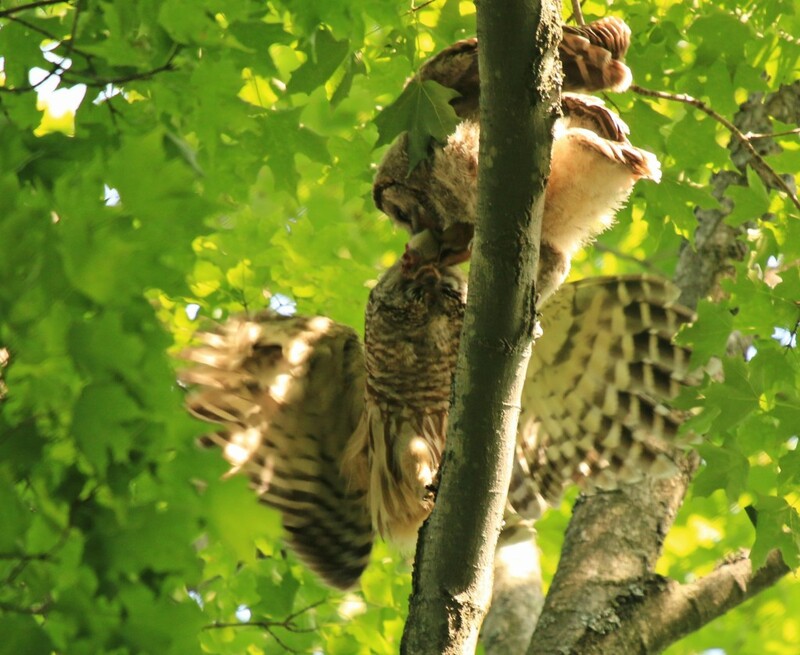 Even then, there was quite a bit of teetering and flapping around while the baby tried to eat. Eventually, the squirrel got swallowed whole. Down the hatch! 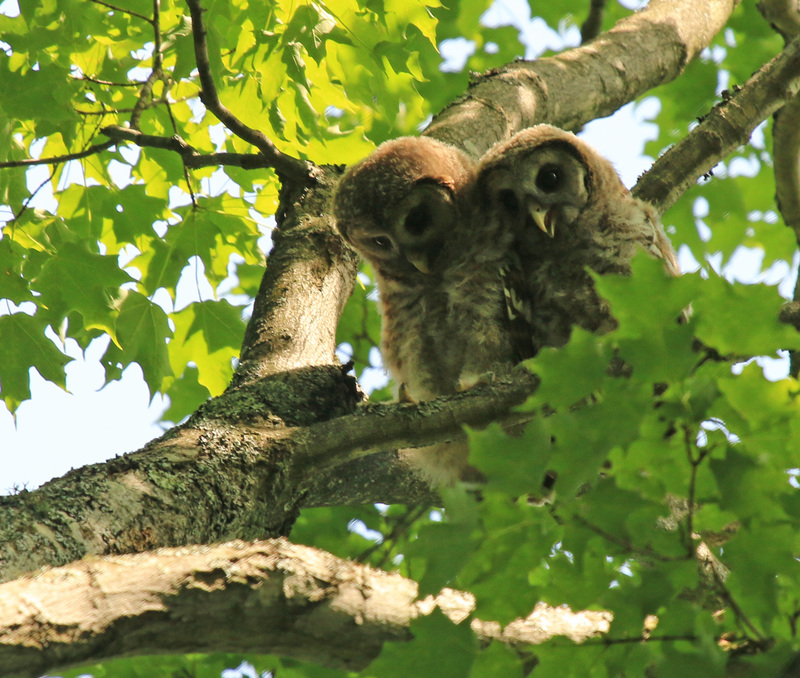 This was the last day I photographed the baby barred owls. They were looking quite a bit like their parents by this point. The owlets remain with their parents for a few weeks, continuing to be fed by them, and also learning to hunt on their own. By fall, they disperse to their own territories. 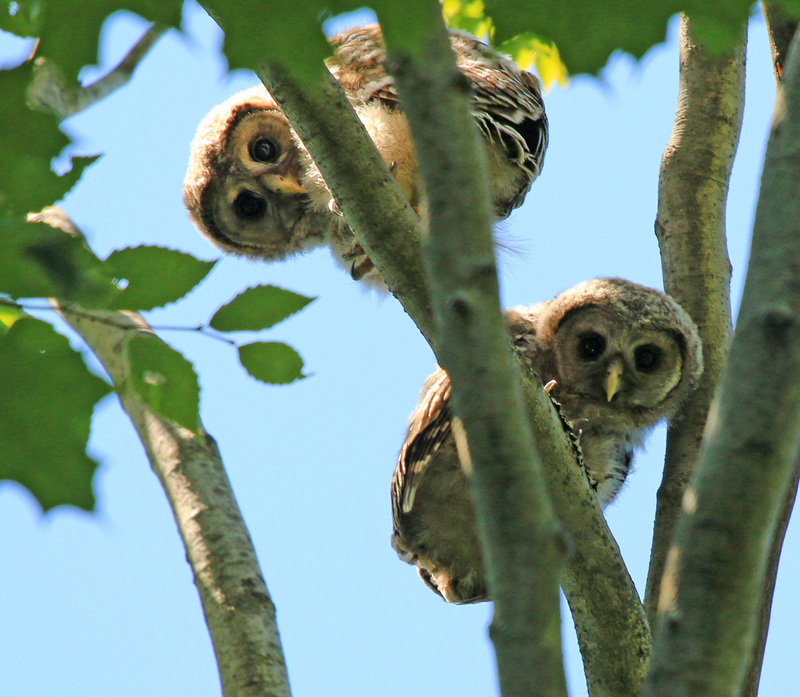 Watching these Barred Owl babies growing up taught me a great deal about the value of remaining still, and watching events unfold in front of me. 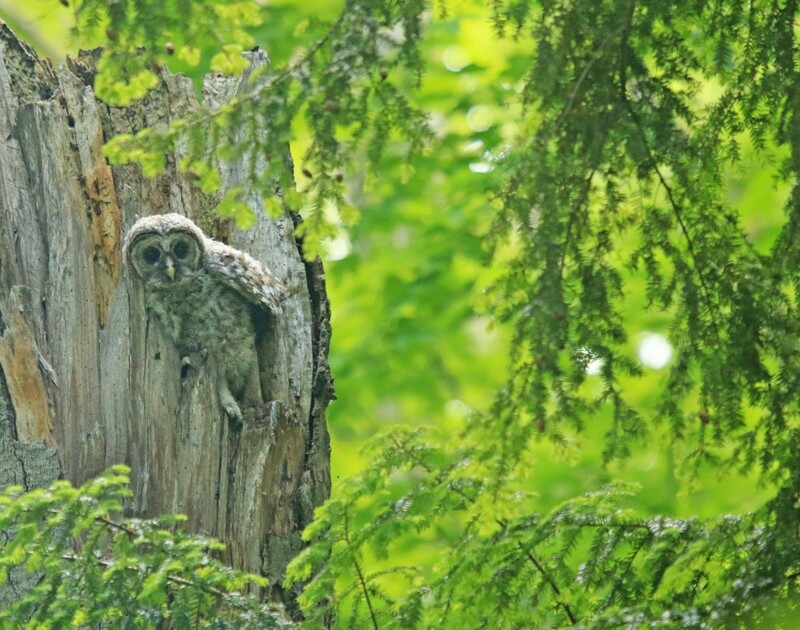 I started out using a blind, and sat under a camouflage blanket, but the owls just got used to me being there and knew I wasn’t going to cause them any harm. Thanks Barb! It was the best!